Kernel Season's Popcorn Seasoning Variety Pack. 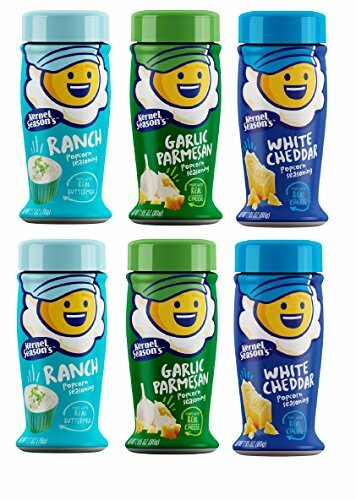 Pack of 3 Different Flavored Popcorn Seasonings, Flavors Included: Ranch (2.7 oz), Parmesan & Garlic (2.85 oz), and White Cheddar (2.85 oz). You get 2 of each flavor, making this a 6 pack. Gluten Free and 100% Natural. Great Sampler Pack to Spice Up Your Popcorn! If you have any questions about this product by Kernel Season's, contact us by completing and submitting the form below. If you are looking for a specif part number, please include it with your message.